Everyone knows I'm a meal-planning, menu-making person! If one of your resolutions was to be more organized and save some cash through meal-planning, consider this a gift to get you started on the right foot. We do have a method for our madness! You can find the easy formatting for how we plan our menus each month in this blog post. Even if our daily themes are not exactly what you have in mind for your family, it is easy to alter these for your own family. Y’all, look here…I am not only a baker! I’m actually a pretty good cook! Of course, my standards were raised pretty high after living in Italy. I mean, their food is incredible! It’s so fresh and they make a point to use what is in season. Yesterday, on our FB page, I posted a picture of a giant pot of homemade Italian ragu! Here in America, ragu is something you’d see on a jar label, but in Italy it’s a homemade meaty pasta sauce! I have not purchased a jar or can of pasta sauce in FOUR years! There have been a BUNCH of requests for the recipe so here you go! You’ll love this super simple recipe! In my photos, you’ll see my recipe has been sextupled so keep that in mind if you only make one batch. You're not gonna have the giant pot I do! Ha! Here’s the thing though…you should at least double it. Then you can put some in a Ziploc bag, stick it in the freezer, and be 10 minutes from supper one night! Or you could do what I do and gift a bag to a friend that may be sick, recently had a baby, or just needs some lovin’. Bonus, there’s no dish for them to worry about returning. I personally make six batches at one time so I can have a ton in reserve! In a deep skillet, do a good swirl of olive oil and turn it on low. We aren't onion people, so we left it out! Toss the veggies into the pan with the oil and cook them on low for about five minutes. Meanwhile, put all the meat in a skillet and cook throughout. Once the meat is done, put the meat and veggies into one pot. Then add the water and tomato sauce right in there! Stir well! The veggies and meat all mixed up! Water and tomato sauce go right in there with it all! Then, there are two ways to do this! Get that pot up to a boil and stir often for about 10 minutes... OR you can do it the Italian way and put the pot on low and cook for about an hour and a half, stirring occasionally. If that ain't pretty I don't know what is! When you’re finishing method is done, whether it be 10 minutes or the hour and a half, turn off the stovetop and lay a sprig or two of rosemary right on top of the ragu (I forgot to include a picture of that. Oops). Put a lid or towel over it for a few minutes while you grab out bowls and forks. That’ll give it an incredible boost of flavor from the aroma! Also, if you’re eating it now, this is a great time to put your pasta noodles on. Serve or bag it up! That’s it, y’all. It’s awesome. You’ll love it. Enjoy and buon appetito! Little d has been very diligently singing and talking to his potatoes...and telling them jokes of course! His dedication is sure paying off! My least favorite question of all time is "What's for supper?" I KNOW I'm not the only mama who gets a little rowdy over that question. My own mama used to respond with "Whatever you're cooking!" Haha! Yeah, this is what my crazy mama eyes look like. But alas, these kids want to eat three times a day!!! Who knew? Haha! So, we have a little method that saves our family a lot of time and I want to share it with y'all! 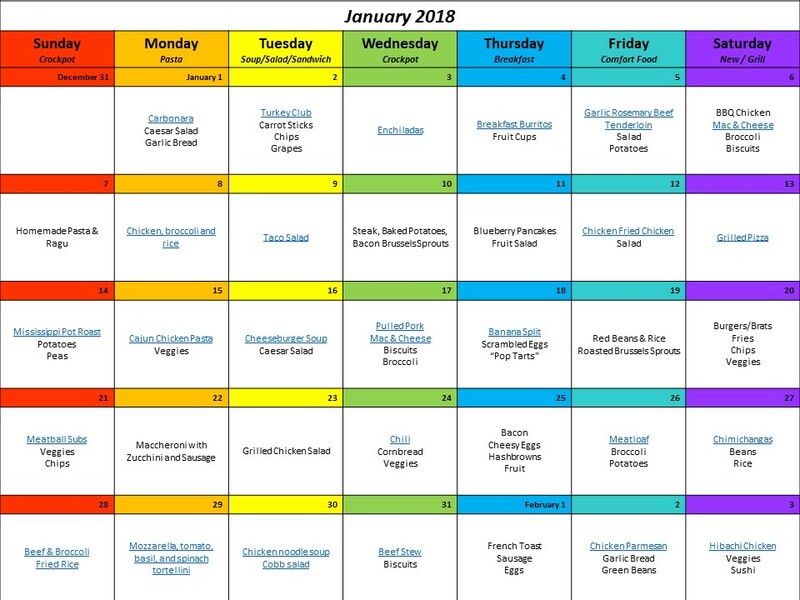 We plan our meals by the month. I know, I know, it seems so daunting to do it for an entire month! It's even worse for us because I get a bad case of food boredom! I am not a huge fan of having the same meal more than a couple times a month...max. So, we started a new process for food planning and it has changed my planning time from a couple of hours of digging through cookbooks and Pinterest and asking the family what they think to about 15 MINUTES! It's true! Here's what we do. We theme out each night of the week with very loose themes. Loose is the important word here. When we were more restrictive on our themes, it made planning more stressful. Here is our weekly schedule but yours can be whatever your family likes to eat! Our schedule looks like this but adjust it to whatever y'all like! Sunday: Sunday Supper - this is a slightly more in-depth meal that might take a little longer to prepare. I do these on Sundays because we grocery shop after church then head home for the day. Monday: Pasta - this can be any sort of pasta dish! After living in Italy for three years, we take our pasta very seriously! Tuesday: Crockpot - Our kids have practice on Tuesdays so this is a perfect way to balance out the work. There are a million things you can stick in the crockpot so the ideas are endless! Wednesday: Soup/Salad - A lot of times these soups end up going in the crockpot so bonus there. We do, however, try to do a slightly more adventurous salad for this. Friday: Take out/eat out - We don't eat out a ton but having this scheduled once a week made it a lot easier to say no to stopping in at a fast food place or something during the week. Saturday: Adventurous food! This is the time we introduce our kids to stuff they're less likely to try. They're super receptive to this because they know they're going to like pretty much everything that's prepared throughout the week so they're up for an adventure. Plus, they watch a lot of Food Network and they're not afraid of food! Then, we sit down together and each person chooses one meal for each theme. This is a perfect system for us because we happen to have as many family members as typical weeks in a month. When I have some down time, I browse Pintrest and pull some ideas into a Monthly Menu board and then I have them at hand when it comes time to make the actual menu. I like to jot it down in pencil on a free printed calendar. We shop once a week so our produce stays good but also so if we miss a day (we've eaten leftovers or gotten wrapped up at an event and ended up eating out - hey, it happens!) we don't waste food and we can cycle that day into the next months menu. In addition to that, each of our children chooses one of the themes to cook for the entire month. It's a great opportunity for them to learn to cook with our assistance. Doing the same theme for a month gives them a chance to have some practice. Each month, they do something different. We eat dinner together every single night, no matter what! I really hope this method helps your family create more time to be together and relieves some stress!